HD-torrents is one of the best HD trackers. This is one of my go to trackers for untouched blu-rays and remuxes. Users can join through invitations. 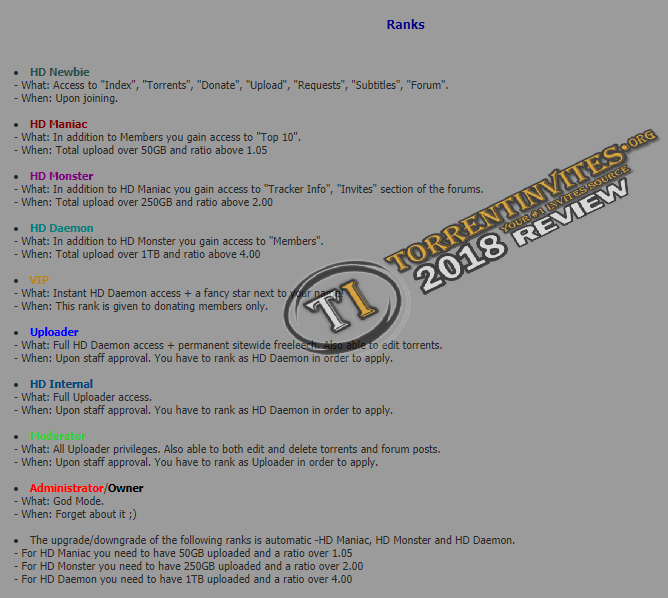 This is one of the must join trackers and currently among the best if you can't join HDbits or Awesome-HD. The thing is that you need a seedbox or high speed connection to survive on this tracker. No other way around that. There is a requirement to download at least 15 GB per quarter (3 months). The year is divided into 4 quarters. Statistics will start on 0:00 on 1st day on every quarter. If a member has not downloaded 15 GB till 26th on 3rd month of every quarter (March, June, September, December) he/she will be informed by blinking value of the downloaded amount during current quarter. If the user has not downloaded 15GB till 23:30 on last day of the 3rd month of the current quarter his/her account will be disabled. All newly registered members will enjoy a grace period until the 1-st day of the next quarter. The rule is valid for all members except VIP and above classes. The staff members are very friendly from my experience. The forums are active. A lot of information regarding hardware, software, encoding and quite sociable. HD-t has many talented internal groups and a lot of very good quality HD content and are very quick in uploading Blu-ray releases. HD-t should be in discussion for one of the best trackers for HD content. I see people always mentioning AHD, HDB, Chinese trackers, but HD-t not so much. It needs to get some love. Options to buy accounts and p2l don't help with the love and likable image but I say that content makes up to it. The site isn't polished, but it has almost everything you could want. There isn't any 100% freeleech so when starting you have to choose wisely what to download so that you don't get in a trouble. The easiest way is to just get a seedbox for one or two months. It's not hard to build a good ratio here if you have a seedbox (Deluge). Preferably get one that you can run both ruTorrent and Deluge and then use autodl-irssi to download the torrents to Deluge's watch folder). Auto-dl works very well on this tracker and will gain you a lot of upload. Earning bonus points is very hard. TheTrader, John Gara, i2ipman and 16 others like this. This tracker is a wonderful place! how fast does this tracker get the newer movies? comparable to IPT, do you think? Cant view images, Imgur is blocked here. What should I do? Try to open the images with a proxy/VPN. YusukeUramesh, kirill and The Night like this. Imgur is banned/blocked in some countries mate , try out what Trader's said ! YusukeUramesh, Rhialto and kirill like this. This tracker is really good. Highly quality stuff! Good tracker and content but not so good user support. jimmy7 and dEzAsTeR like this.